When Napoleon crowned himself Emperor this upset the former enemies of France enough to start a new coalition against him. The British started this war, but was eventually able to talk Austria and Russia into joining him against the French. British Prime Minister William Pitt would spend a great deal of time and energy trying to talk people into this war and was eventually successful. The first of the important battles of the war would be the Battle of Ulm (1805), which was fought over the strategic city of Ulm. There were a number of smaller battles in the area leading up to this one as Napoleon tried to prepare his army strategically for a battle he knew would be important. 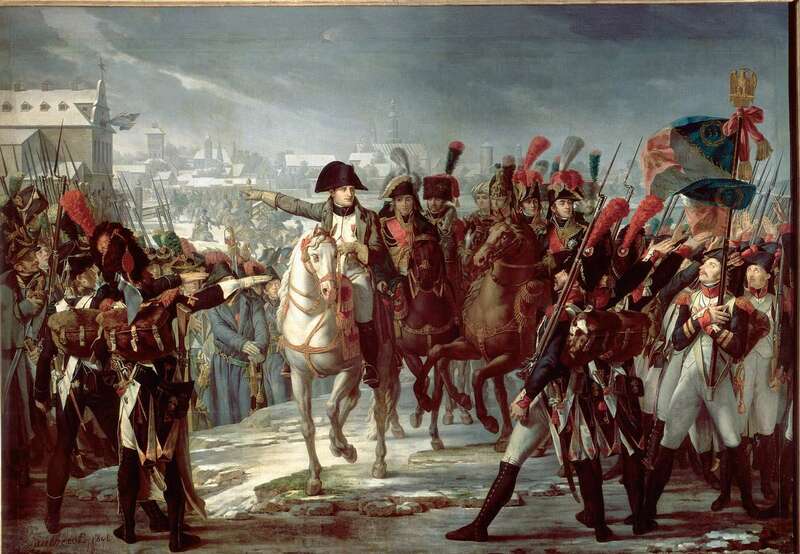 During the battle Napoleon concentrated on taking the bridges that led from the city so that he could surround the Austrians inside the city. Once this was done the Austrian General realized he had been outmaneuvered and was forced to surrender. French was a better army by far. The Revolution had hurt the French navy badly since they had lost most of their best naval officers during the Reign of Terror, and those that could help were scared of the British after the Battle of the Nile. Napoleon was so interested in this invasion that he considered the idea of flying his troops across the channel in balloons instead of sailing across, but he decided that this would fail because of high winds in the channel. A plan was created to have the French and Spanish attack the British in the West Indies (Caribbean) in an effort to divert the British and allow his army to slip across the channel. Ironically, the 60 million francs that he had received for the Louisiana Purchase was used to fund this invasion attempt, a sum which the US had borrowed from the British in order to pay the French. The French fleet would escape Toulon during a major storm that had blown the British blockade away from the port. Once the British realized they had gotten away Admiral Nelson would jump in his ship to catch up. Nelson’s plan was to lure them into a battle, which would happen soon after.